I am a journal junkie. I started a gratitude journal about a month ago. I also have a “regular” journal where I just write down whatever comes to mind – quotes that catch my eye, to do lists, ideas for projects, or just how I’m feeling, etc. But one type of journal that I have not tried is an art journal. I’ve seen lots of beautiful, inspiring photos on Instagram and Pinterest of people’s art journal entries, but I’ve been too intimidated to try it because my art has always been words and I sadly did not inherit the paint/draw/sketch/sculpt artistic gene. But recently, I’ve been admiring my friend Cody’s art journal entries because she is a true artist and posts some of the most amazing pictures. 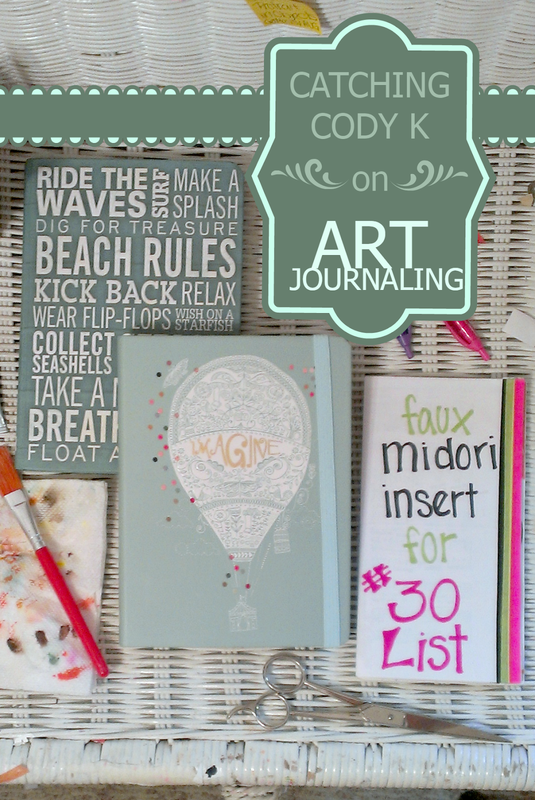 Cody blogs over at Catching Cody K and I will let her tell you more about her art journaling and creative process. Hey Everyone. My name is Cody and my blog is Catching Cody K. I am a lifesyle blogger. I try to post honest and real posts about my life such as my medical concerns over my stomach, having a special needs brothers, and living life in Florida. But today I am so thankful to be here as a guest poster talking about something very dear to me, my art. I have always created art. When I was younger I would carry a cheap composition notebook. My mother saw how much art meant to me and would buy me art kits for Christmas and Birthdays. However, I was very much into crayons and colored pencils then. Somewhere along the way, I just stopped drawing. I guess it got a little boring drawing imaginationary characters (anime people) and everyday life. Then this year, I discovered the world of Art Journaling thanks to good ol’ YouTube. Art journaling is a way to express yourself how ever you choose. There are soo many wonderful videos on this topic. I could have spent hours watching but I knew that wasn’t going to improve my skill or fill an art journal that way. I had to put in the time to do so. I started off going to Wal-Mart, cheap and easy. I found a Smash Book on sale. At the same time I bought a set of cheap acrylic paints to try out. However, I felt really bad about covering up such beautiful paper with paint in that book. That’s when I knew I need a journal that could handle acrylic paints. That is when I went back to YouTube and then Pinterest to see what journal/book would be best for paints. I found great examples but I knew I was going to fill an imaged book if I didn’t buy one soon. So I took a trip to Michael’s and then to Barnes and Nobles to fiddle with each type of different paper and sketch books to see what I liked best. I decided to buy two already bound books from Barnes and Noble. One would be for me to create and try whatever I want inside. The other would be for me to use for my art journaling groups; I am currently in three. There are two on Facebook that I am in; Journal52 and The Documented Life Project. They post prompts weekly to help inspire or give direction. Those are great groups if you are starting out and want inspiration or need help. I also am in #GetMessyArtJournal group, that is a closed group of girls that create art weekly. After I got the art journals home, it was just a matter of filling them out. I love to use acrylic paints. I love how fast they dry, perfect for the impatient artist. Then I also discovered different types of art journaling. There is the normal painting, then mixed media where you can use different types of paint or add elements, there is also glue journaling. 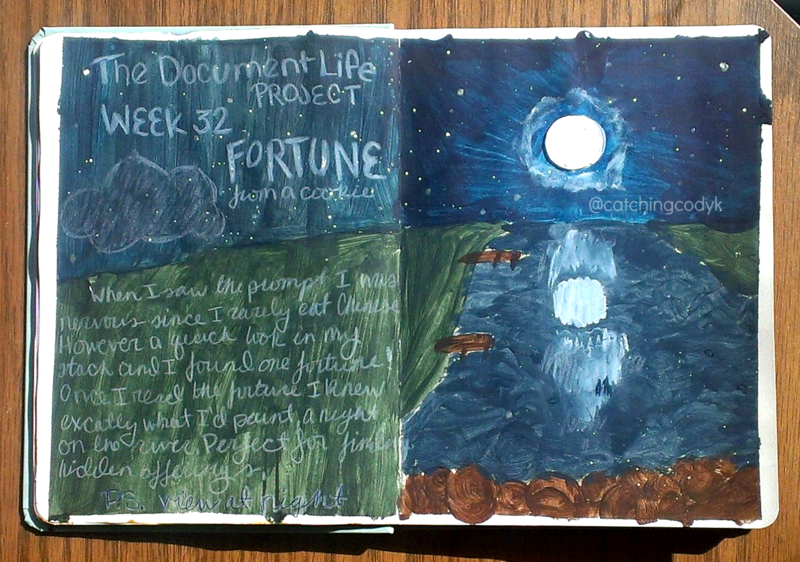 Glue journaling is using what you have around you (like magazines) to express yourself. 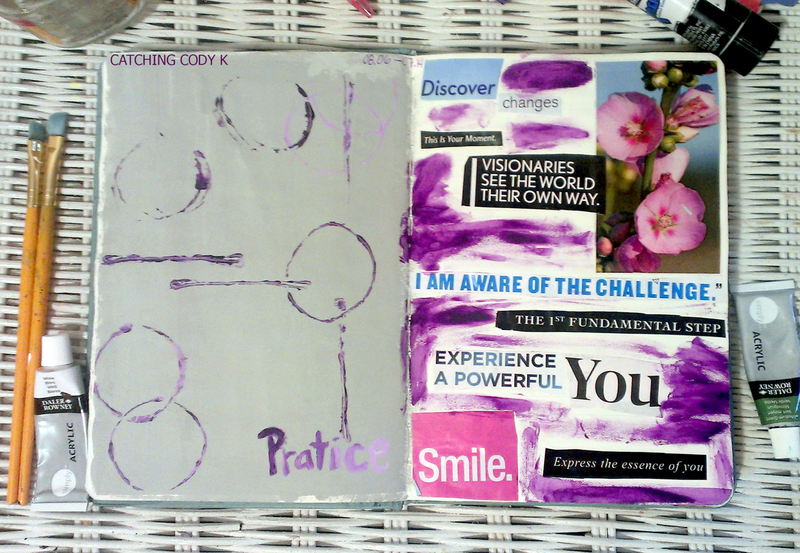 I love the glue method of art journaling because when I am tired I can still create a page expressing myself. Yet I never try to limit myself on one style. I create whenever (sometimes right before bed) and however I like. I have been creating in my art journals for one whole month now. I can’t believe how much I have change from then til now. I have improved my skills in every way. I know more about the style I like to create in. I know more about myself now. All because I decided to just go for it. So what if I didn’t like a page, I still created that page. In 10 years from now I don’t want to look back and wish I created. I want to look back and see every single journal I created. Imagine how much improvement could be accomplished by then. I suggest for those that are new or anyone that wants to create, look up inspiration. Try YouTube, or Pinterest or Facebook (try DaisyYellow or #30lists too) but don’t stop there. Find your medium. Are you an oil gal or a watercolor man? Or something else? Then your paper of choice. What you use for an art journal is up to you. Some people like already bound books, like I do, others don’t mind coils. Where other people like loose leaf paper. Don’t get caught up in everyone else’s style or way, just yours. Find what works for you. You can’t create art by watching, only doing. Remember that if you start today, you’ll be better tomorrow. I hope that I inspired you to create. Thank you so much Mia for the chance to be here. =] I hope all of you will follow my social medias, and I would be happy to answer any questions or help inspire you.